Felco offers custom attachments and specialty buckets for specialized materials and applications. 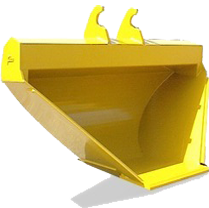 We can also custom-build any bucket for the needs of your project. We have the capabilities and facilities to custom-build any excavator bucket or excavator attachment for your specific project needs. If you need custom construction equipment, road-making equipment or another attachment engineered to improve performance, contact us. We also offer attachment options including custom ears, replacement ears, bolt on cutting lip, axle repair assembly, adapter & tooth kits, replaceable scraper teeth as well as any custom excavator attachment or custom excavator bucket options you may need. What difference does a Felco Backfill Conveyor make to me? Instead of ten dump trucks driving back and forth all day – we have none!